INTRODUCTION. Of minds and men (B. Gorayska, J.L. Mey). THEORETICAL ISSUES. Cognition. 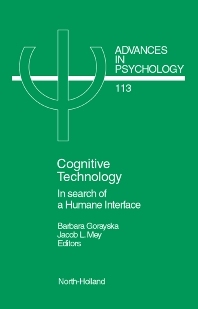 Epistemic technology and relevance analysis: Rethinking cognitive technology (B. Gorayska, J. Marsh). Imaginization as an approach to interactive multimedia (O.F. Kirkeby, L. Malmborg). Intelligence augmentation: The vision inside virtual reality (F. Biocca). Modeling and Mental Tools. Patience and control: The importance of maintaining the link between producers and users (D.A. Good). "And ye shall be as machines" - or should machines be as us? On the modeling of matter and mind (H. Haberland). Levels of explanation: Complexity and ecology (H.M. Chan). Agents. Agents and creativity (M.A. Boden). Virtual (reality + intelligence) (M.W. Krueger). CASES AND PROBLEMS. Communication. Heuristic ergonomics and the socio-cognitive interface (R.O. Lindsay). How to support learning from interaction with stimulated characters (A. Kass et al.). E-mail and intimacy (R.W. Janney). Communication impedance: Touchstone for cognitive technology (R.G. Eisenhart, D.C. Littman). Education. Technology and the structure of tertiary education institutions (K. Cox). A Chinese character based telecommunication device for the deaf (O.L. Clubb, C.H. Lee). Teaching syllogistic to the blind (L. Goldstein). Using microcomputer technology to promote students' higher-order reading (C.K. Leong). Planning. Issues in the development of human-computer mixed-initiative planning (M.H. Burstein D.V. McDermott). Committees of decision trees (D. Heath et al.). A learning environment to teach planning skills (R.C. Schank, S. Szegö). Applied Cognitive Science. Cognitive technology and differential topology: The importance of shape features (T.L. Kunii). Hypertext and reading cognition (A. McHoul, P, Roe). Verbal and non-verbal behaviours in face to face TV conferences (H. Tamura, S. Choi). Would electronic argumentation improve your ability to express yourself? (J.A.A. Sillince). Shared understanding of facial appearance - who are the experts? (T. Roberts). Interactive cognition: exploring the potential of electronic quote/commenting (S. Harnad). Indexes.